A Theory of Change is your best guess about how your work impacts the issue you care about. This worksheet provides a simple starting point for thinking about the causes that contribute to your work. A Theory of Change lays out the link between your vision (what you want to see in the world) and your mission (how you make that happen.) It’s like a map of how your work will lead to changes in society. 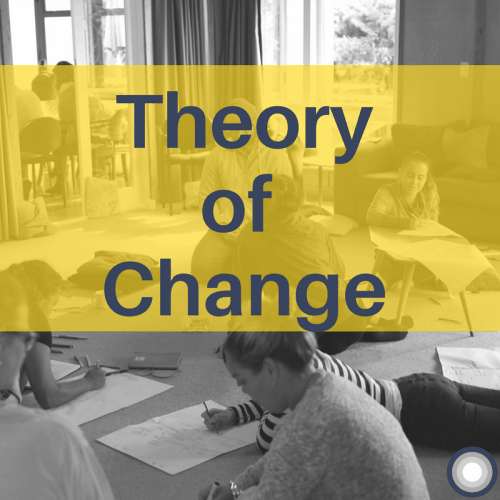 Why create a Theory of Change? How do you know for sure whether you’re making a difference? Sometimes it’s easy to bustle around, being busy and active, without actually knowing what impact our work is having on the young people we’re trying to serve. What if there was a more effective way of creating the change you want to see? A Theory of Change can help you to figure out the impact you’re really having, and help you improve your strategy. work backwards from your vision of the future – what would need to be true in order for your preferred future to occur? make objectives which explain your contribution to the bigger picture. There’s no such thing as a perfect Theory of Change. You can only create it with the limited information at your fingertips at one point in time. Once you’ve made a Theory of Change, go out into the world and test it! Then, come back to your Theory of Change, evaluate how things are going and update your Theory of Change and your work out there in the world. Creating a Theory of Change isn’t easy. We recommend keeping an eye on ImpactCanvas.Co where Chelsea Robinson and Sam Rye, previous Lifehack team members, are working on a support manual for a later prototype of a similar Theory of Change worksheet. Head over here if you would like to read up on our Theory of Change for Lifehack.